Walking is the most popular activity in Stanley Park. You can walk completely around Stanley Park which is 9 kilometres or within the park. 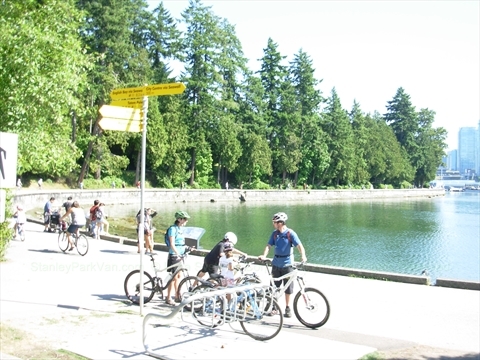 The Stanley Park Seawall has a separate lane for walking. Bicycles can only go one direction around the park, but you can walk both directions around the park. You don't have to walk around the entire park, there are many options where you can walk part of the seawall or within the park for any distance you wish. There are benches all along the seawall so you can sit if you get tired. Every few kilometers there is a Concession Stands where you can get food and drinks. There are water fountains along the way also, usually near the concession stands. Within the park there are many paved paths and trails which you can use to visit the many attractions, statues, plaques, monuments, famous trees, etc. within the park. A number of people walk to North Vancouver or onto the Lions Gate Bridge via the Stanley Park Causeway. After some fatal accidents caused by bicycle/people interactions, the province in 2016 upgraded the sidewalk to better accomodate both cyclists and pedestrians. This is a very long walk. Note that the east sidewalk of the Stanley Park Causeway allows for pedestrians to walk north-south and bicycles to go north only. The west sidewalk of the Stanley Park Causeway allows for bicycle to go south only. No pedestrians are allowed on the west sidewalk.